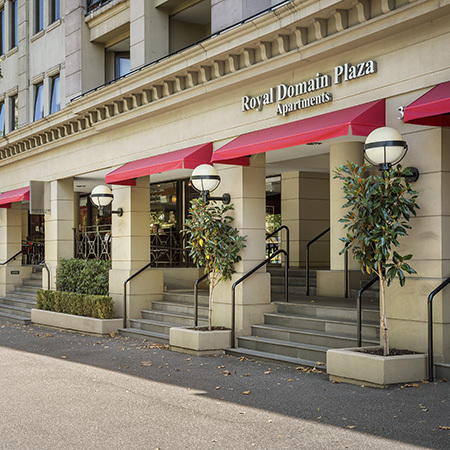 Royal Domain Plaza at 360 St Kilda Rd is a quality lifestyle choice of living. Truly delightful apartments in one of Melbourne's most sought after positions opposite The Shrine and The Royal Botanic Gardens. A boutique building of only 135 apartments neighboring some of Melbourne's elite buildings such as The Melburnian, St James, The Domain & The Royal Domain Tower. Apartments feature, High ceilings stainless steel kitchens, quality tiled bathrooms and en-suite plus stylish furnishings and fittings throughout. Other features include, video-monitored security entry, lift access & shared use of a library & waiting room. The buildings architecture is a key feature where a series of classically inspired arches surrounding a central water feature bring grace & class to the central foyer of the block. Situated in a blue chip location, hop on a tram & you are only a short ride away from the CBD with its laneways, arcades, funky cafés, hip bars & retail action. To inspect apartments for sale or lease, please call our office for an appointment.